NOTE: This review borrows from my previous review of Mr. Jack. The news from London of the brutal murders was still fresh when word arrived that a prime suspect in the killings was reportedly in New York. Sure enough, murders with a similar modus operandi began occurring. The erstwhile New York detectives were determined to put an end to the killing and capture the infamous Mr. Jack. But just who is Mr. Jack? That is the challenge. Discover his – or her – true identity and catch him before he flees the city. Several years ago designers Bruno and Ludovic Maublanc teamed to bring us Mr. Jack, a clever two-player game that proved quite popular, capturing the International Gamers Award as the best two-player game of the year. In the game, one player assumes the role of Mr. Jack, while the other is the detective using his assistants to hunt the devilishly clever killer. In an innovative twist, both players maneuvered the eight investigators, with Mr. Jack attempting to keep his identity secret until he can make good his escape. Of course, the game was a loose recreation of the investigation of the infamous Jack the Ripper murders that terrorized London in the 19th century. This new edition plays in basically the same fashion, but changes the setting to New York. There are a few minor rules changes, but for the most part, it is extremely similar to its father. The board depicts a section of Manhattan, complete with buildings, docks, parks, gaslights, and Metro entrances, most of which are added as the game progresses. The eight characters each have unique powers, and deciding how and when to use these powers allows players fairly wide latitude in terms of creativity. Other components include eight alibi cards and eight character cards, one for each character. Each turn, players alternate moving the four characters whose cards have been revealed that turn. On the first turn, the detective selects and moves one of the characters, then Jack moves two others, and the turn concludes with the detective moving the remaining character. This pattern reverses on each of the game’s eight turns. All eight character cards will cycle-through over the course of two turns, and then be re-shuffled. Thus, players cannot continually move the same characters over-and-over again, as the system forces players to divide their movements and actions amongst all of the characters. Choosing which characters to move is critical, as it can not only benefit you, but prevents those characters from being utilized by your opponent. Characters can move from 1 – 3 spaces, and each has a special action that they can perform. For example, Alfred Ely Beach, a visionary, must construct a new Metro entrance. The Metro can be used to move around Manhattan in a quicker fashion. Lewis Howard Latimer, an engineer, must install a new gaslight, which illuminates adjacent spaces, making it more difficult for characters to hide. Emma Grant, an ecologist and wife of the city’s mayor, must create a park by inverting an existing gaslight, building or Metro entrance tile. In addition to adding aesthetic value to the city, parks also provide convenient hiding places for characters. James Callahan, a city detective, must move an investigation tile, which can impede the movement of characters. Monk Eastman, a local mafia godfather, can move another character. Other characters can erect new buildings (which impede the movement of most characters), swap the position of two characters or move a steamer to a different port. Steamers can be used by Mr. Jack to escape the city. All of the abilities can be quite useful, and choosing how best to utilize these abilities can be critical and is part of the challenge. After all four characters have moved, the Mr. Jack player must state whether his alter-ego character is visible or invisible. A character is visible if he is adjacent to a gas lamp or another character. If Mr. Jack states that he is visible, then all characters that are invisible can be removed from suspicion, and their tokens are inverted. Likewise, if Mr. Jack is invisible, then all visible characters are inverted and removed from suspicion. Thus, the game doesn’t force the detective player to rely on his memory, which is a good thing. The challenge for the Mr. Jack player is to keep his character hidden amongst numerous characters that are either visible or invisible, thereby making it difficult for the detective player to use a process of elimination to deduce his true identity. The detective player, of course, is attempting to do the opposite, so as to gradually eliminate characters from suspicion. The detective player should beware if Mr. Jack states that his character is invisible, as he can only attempt to escape if he is not seen. If the Mr. Jack player successfully moves his secret character onto a steamer or through the one land exit while he is invisible, he has escaped and wins the game. In order for the detective to win, he must reveal Mr. Jack by moving another character to the same space and making a successful accusation. 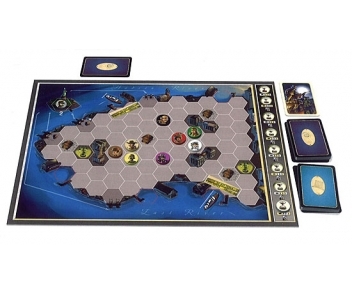 It isn’t enough to simply prevent Mr. Jack from escaping, as victory goes to Mr. Jack if a detective has not caught him by the end of the eighth turn. One additional twist added to this version is the presence of the informant. Visiting the informant when he is in a talkative mood allows the player to take an alibi card. This allows the detective player to eliminate that character as a suspect, while the Mr. Jack player denies the card he takes to the detective player. 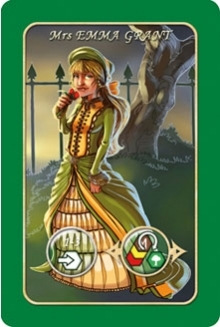 Once consulted, the fickle informant moves to a different location in the city and becomes reclusive for one turn. The informant can be useful, but generally a player must visit him early and often in order for him to be effective. Like its predecessor, Mr. Jack in New York is a clever, 2-player deduction game that is fast, fun and challenging. While the rules are simple and the mental gymnastics required aren’t overly taxing, it still requires clever movement and ability combinations in order to be successful. The detective player may have a slight advantage, but it is only slight. Most of the games I have played have all been tense, and haven’t been decided until the final turn or two. In the hands of a clever player, Mr. Jack can be quite devious and slippery, and catching him will take all of your skills as a detective. The question, of course, is whether one needs both Mr. Jack and Mr. Jack in New York in their collection. The setting in the new version is different, as are most of the characters’ abilities. This does provide some variety. However, unless one is an immense fan of the game and plays it often, the small differences are likely not enough to justify owning both. That is not a knock against the game, as both are fine games and either would make a fine addition to one’s collection. Tom Rosen (12 plays): It’s clear that Cathala and Maublanc learned a lot about the Mr. Jack system in the intervening three years after Mr. Jack’s initial release. They changed the game just enough to create a stand-alone game worth owning, while leaving it still true to the original. The most striking thing about the new board and gameplay is that it feels much more open. The fact that there are fewer buildings and lights obstructing your path make the game feel more dynamic than the original. Where Mr. Jack can sometimes feel static, Mr. Jack in New York is fluid. I still go back to the original from time to time because I particularly enjoy the new setup rules introduced by the excellent Mr. Jack Extension, but overall Mr. Jack in New York has proven to be a very worth successor. The fact that Piero returned to do the artwork again is a also a big plus worth mentioning. Ted Cheatham (one play): I thought this was a very nice change to the original system. It felt like being with family in a different place. And, I think different enough to actually feel unique. 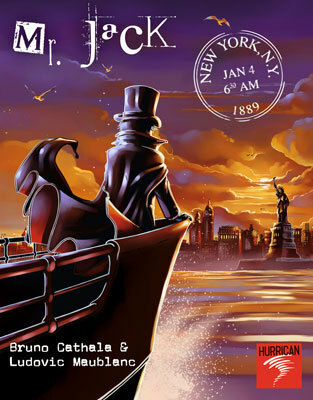 This entry was posted in Reviews and tagged 2-player games, Bruno Cathala, Hurrican Games, Jack the Ripper, Mr. Jack, Mr. Jack in New York. Bookmark the permalink.